The most recent update to Pokémon GO carries significant heft. 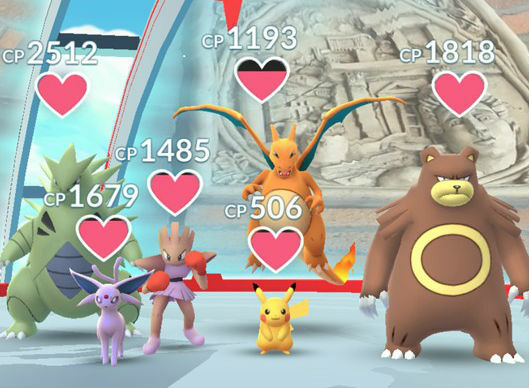 Gyms have been revamped, Players can earn a plethora of new badges and items, and raids against super-powered Pokémon are finally a thing. Niantic's promised raid feature went live last night, but there's a temporary condition: Currently, only players who are level 31 and above can participate. Niantic promises all players will gain the privilege to whack monster-sized Pokémon across the next few days. Keep an eye on the official Pokémon GO Twitter account for updates. What constitutes a Pokémon GO raid, exactly? Well, if you're the proper level, you might catch a glimpse of a giant egg on top of one of your neighborhood gyms. When the countdown atop the egg finishes up, a Pokémon of monstrous proportions (and with high CP to match) hatches and goes on the defensive. You can try to subdue the beast with up to 20 other trainers, as long as you have a raid ticket. You get one free raid ticket a day by visiting gyms, and you can buy premium passes via the in-game shop. If you succeed in a raid, you'll get exclusive items like Rare Candies, Golden Razz Berries, and more. Check out our Pokémon GO raid guide for a full list. Pokémon GO is now one step closer to becoming a full realization of its teaser trailer – though Mewtwo is still MIA. If he does show up by some miracle, you might want to do better than throwing Pidgeys and Butterfrees at him like the people in the trailer.